This really belongs at a lower level, i.e. a central sound server, in other words PulseAudio. Expecting all apps to use Phonon is not realistic, getting them to all use PulseAudio is actually feasible. So if PulseAudio takes care of such hardware changes (and it does, through HAL), all apps will pick them up at once. I don't think a soundserverless setup will be able to react to such hardware changes in a way which gets picked up by all apps any time soon, PulseAudio really looks like the best solution right now. I did look at Pulse and you should know by now that I'm not trying to stand in its way. To the contrary I think Pulse is doing some things right. That doesn't mean it is the magical solution to everything. The dialog Jos got to see is about KDE stuff: i.e. Phonon giving a notification that "NVidia CK804" failed and it's falling back to something else. 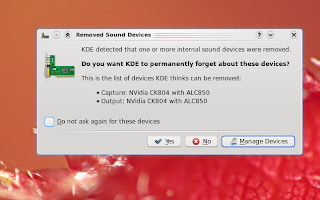 With KDE forgetting about the device it won't try to use it in the first place and so won't give a notification about it anymore. Also you won't see the device greyed out in the device list anymore. Whether this logic is implemented using Pulse or not is orthogonal. What happens if you let phonon delete this devices and turn them on in BIOS again? Will they show up in phonon again or do they disappear for ever? @mkretz: Well, at least in KDE 4.0 and 4.1, phonon-xine shows a single PulseAudio device and in Fedora we patch Phonon to use that device by default if it's available. (And I've looked closely at the code when writing that patch and also done extensive testing.) So there will never be a "Hardware device Foo failed, falling back to Bar" if PulseAudio is in use (well, as long as there's at least one hardware device - if there's none, PulseAudio will reject connections), because what device to output to is considered PulseAudio's business. I definitely don't know more about Phonon than you, you frigging wrote it. ;-) I'm aware of that, sorry if I didn't sound like it.